Harvey Mattel looks at some of his transistor radios on display at The Wolfsonian-FIU. The exhibit is part of RadioFest, an all day celebration of radio at the museum. Harvey Mattel, a radio collector and enthusiast, stands in front of a selection of his radios on display for RadioFest at The Wolfsonian-FIU in South Beach. A few pieces from Harvey Mattel's personal collection of vintage radios. He has more than 400 in his collection. This neutrowound radio was made in 1927. The radio is part of Harvey Mattel's vintage collection on display for RadioFest, a celebration of radio at The Wolfsonian-FIU in South Beach. Harvey Mattel says there are two kinds of radio collectors: Those who collect for what's on the inside and those who collect for what's on the outside. But you would never know this unless you stepped inside his house or caught a glimpse of the inside of his office. By day, this 67 year old man is a lawyer in Fort Lauderdale. During his off hours, thought, he's a full-fledged radio collector and enthusiast. In his collection, he has more then 400 radios. Among them, a Neutrowound from 1927; the 1933 Air King 52, which is considered one of the most important plastic radios ever produced; and variety of American and Japanese-made transistor radios. In his house, an entire room is dedicated to his collection. The radios cover the walls on shelves. For the first time ever, a portion of his collection will be on display during RadioFest, an all day celebration of radio at the Wolfsonian-FIU in South Beach. The exhibit will be open until March 21. 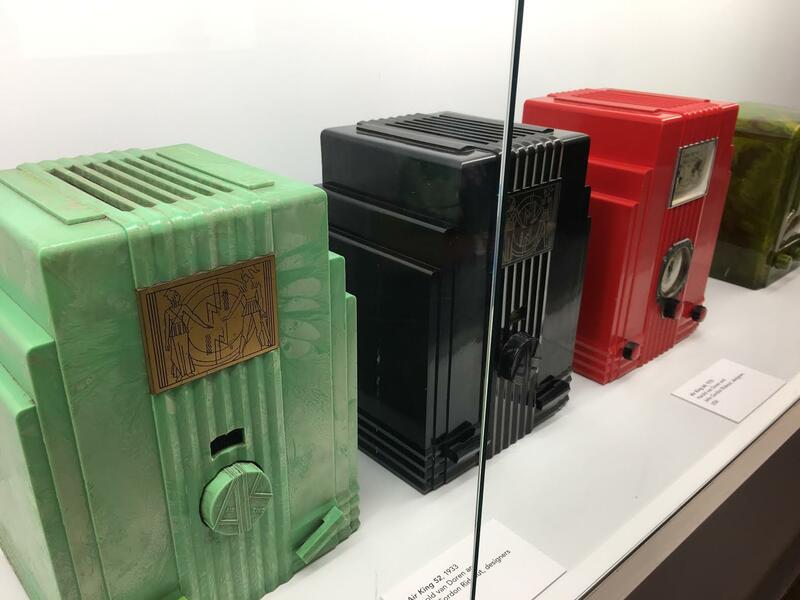 Silvia Barisione, curator at The Wolfsonian-FIU, believes Mattel might be the biggest radio collector in South Florida. The museum has never done an exhibition of radios before although it does have a collection of radios -- just not as many as he does. "We decided to concentrate on radios from the U.S." except with the transistors, she said, which are both from the U.S. and Japan. "Now, we don't pay so much attention to the radio. We listen to the news from the internet," Barisione says. "The object has lost meaning, but it's very important in the evolution of industrial design." WLRN's Katie Lepri met with Mattel at the museum to talk about his journey as a radio collector and his radios on display. Here is part of their conversation. WLRN: Why start collecting radios? What was the first radio that caught your eye? Mattel: I'm a collector by nature. I had been collecting classic jukeboxes from the 1930s and I ran out of room and I needed to look for something smaller. And I was walking around one of the antique shows that come in January and I saw a great little radio and that's how it started. That would have been a Fada model 652 also known as the Temple. Fada stood for Frank A D’Andrea who made radios of Brooklyn New York. It was the design, the materials, the colors. It wasn’t the classic radio we remember made with a wood case and a cathedral look to it. It was totally different. I then discovered that the material was something called Catalin and that’s what I started with. The collection began that day because by the end of the week I had three. Where are some of the places you’ve gone to buy radios? I have gone to Elgin, Illinois; Lansing, Michigan; Kalamazoo, Michigan. Many places in California; many places in Ohio. You can't find many radios in Florida because Florida was not well populated and the humidity would not be conducive to the survival of these radios. In the beginning of my radio collecting, no body really know in the area of Catalin radios and what was rare and what was not. Nor did in the early days, we understand that the Catalin had changed color. What was more strange was the discoveries along the way, rather than where I found them in the beginning. I found them at an antique shows and the radio meets. There really was nowhere else to find them. I never sort of stumbled in an attic or something and found one. Never had that opportunity. You're saying some of the journeys to get to a radio were more interesting. Can you tell me about one that is more memorable to you? There was a man who was an early collector of a mirrored radios. As he got older and his health failed, his collection was auctioned off. I went to that auction and I got a very rare and unique radio. It was an opportunity to buy radios that were not available due to the advanced nature of his collection and the fact that he started and recognized before anyone else the beauty of these things. Being an intrepid radio collector, I knew the history of a particular radio. He had managed to get that out of the estate of Clark Gable. That was a radio that Clark Gable had given to Carole Lombard, his wife who he loved very much, as a gift. And Carole Lombard and her mother died tragically in a plane crash in 1940 on a war bond drive. She was out selling [war] bonds and the plane hit a mountain and he climbed up for three days with the crew to reach the wreckage. But she was gone. Ed [Sage] had acquired the radio and I knew the history of it. He had written about it in a magazine called Antique Radio Classified about 10 years before I acquired it. But when it came up for auction, it was just listed as a 1935 Troy blue mirror radio. So the history of it wasn't known, fortunately, to anyone in the bidding group but me. So when I saw the radio, I knew the history. There was no doubt it was going to my collection, it was just what it was going to cost me. What's most you've ever paid for a radio. What radio did you buy? I'm going to say $22,000, but I'm not sure. The Air King 52 with the Egyptian insert in the crystalline finish that I said there were two that I know. That radio is what I call a cross over piece of design. Mattel says he paid $22,000 for the Air King 52 radio [left]. Not only do radio collectors covet it. People who collect iconic art deco designs [want it]. So the demand is not limited to crazy radio collectors. Other people want them and there aren't a lot. So that's why it's so expensive. What does it mean to have the Wolfsonian showcase your collection? It means a lot. I love the hobby. Most people will come to my house and say I've never seen anything like this. They never knew these things existed. I can just see from the few days the radios have been on display people are just awed by them. That warms my heart. I like this.